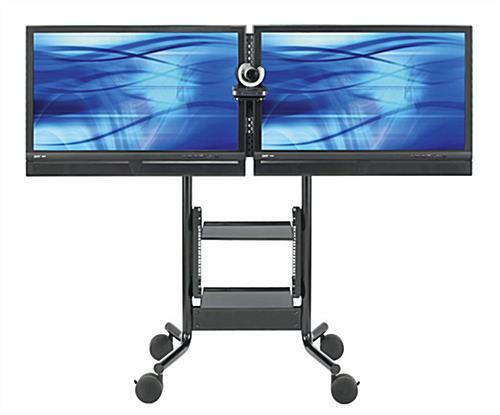 These Rolling LCD Monitor Stands Feature An Adjustable Height Camera Shelf! These Wheeled Multimedia Stations Are Versatile! 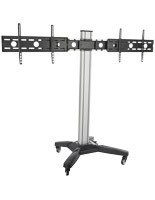 Browse Many Differenr Rolling LCD Monitor Stands In Stock Online! 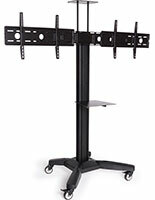 Heavy duty steel stand is perfect for use in schools, conference centers, meetings and tradeshows. Durable black finish and sleek modern design look great anywhere. 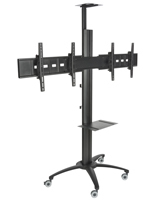 VESA-compatible screen mounts securely support (2) widescreen flat panel TVs up to 55" wide. 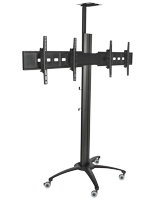 These rolling LCD monitor stands have a modern design that supports (2) 32" - 55" plasma TVs that weigh up to 300 pounds. These height-adjustable steel mounts are VESA-compatible. These versatile equipment racks, rolling LCD monitor stands with (2) locking casters have built in device storage. 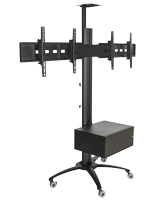 Each of these racks has a 10RU (rack unit) holder, adjustable camera/codec shelf, 6-slot surge protector and a built in cable/cord management tray. These well-designed presentation stands are made from heavy duty steel with a black powder-coated finish. 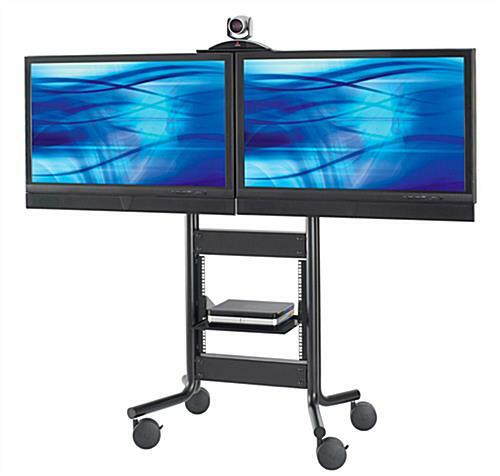 These multimedia AV carts, rolling LCD monitor for schools and businesses are perfect for use in classrooms, meetings, conferences and at trade shows. These easy to set up media stations can hold, move and store audio/visual display devices such as cameras, playback devices, codecs and stereo equipment in any professional environment. 79.0" x 60.5" x 26.5"